Switch over to the “Home” tab on Word’s Ribbon and then click the “Replace” button. This opens Word’s Find and Replace window. In the “Find What” box, type the word or phrase you want to locate. If you only want to find text in your document, you can go ahead and click the “Find Next” button to have Word jump to the next occurrence of that word. Keep clicking it to browse through all the results. If you want to replace the text you find with something else, type the replacement text into the “Replace With” box. You can enter up to 255 characters in the both the “Find What” and “Replace With” boxes, by the way. 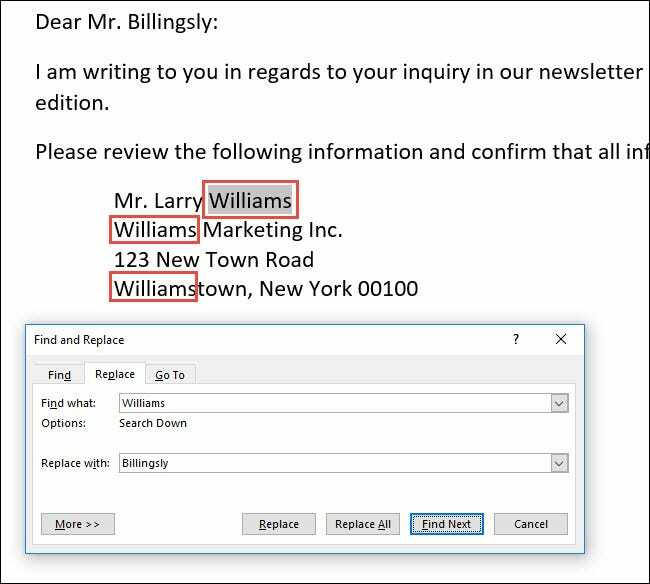 In this example, let’s say we want to replace the name “Williams” with the name “Billingsly”, so we’ve typed that text into the respective boxes. Next, we’d click the “Find Next” button to have Word locate the first instance of the text in the “Find What” box. Word jumps the document to that point and highlights the result in gray, still keeping the Find and Replace window on top for you. Click the “Replace” button to replace the currently selected result with whatever text is in the “Replace With” box. To replace all instances at once without stopping and reviewing each one, you can click the “Replace All” button. Be careful when using “Replace All” because it will automatically replace all instances, including those you might not want to replace. In the example below, there are three more instances of “Williams,” but we only want to replace the next two. In this case, we would only click “Replace” for the second and third instance. If there is a particular instance where you don’t want to replace the text, click “Find Next” as many times as needed until you come to an example where you need to replace text. To exit from Find and Replace, click the “Cancel” button. Use wildcards in your searches to narrow them down to more specific results. Search directly within Word’s Navigation pane to have Word show you which headings have your search terms included under them. Replace double spaces between sentences with single spaces. Search for specific formatting or special characters. The basic of searching and replacing text in Word are pretty straightforward, but there’s a lot you can do with it once you start digging. Previous What Is a Checksum (and Why Should You Care)?